Following in the footsteps of President Theodore Roosevelt and John D. Rockefeller, Jr., the Conch Republic is pleased to announce the creation of the Conch Republic National Parks System. Everyone knows that when times get tough countries create public works programs and Conch Republic is not exception. President Franklin Roosevelt created the �New Deal� during the Great Depression. This Conch Republic is calling our National Parks System the �Real Deal�. We are creating real parks! Through our Conch Republic Squire Program we are taking private land and committing it to public purpose as green space in perpetuity! ...all while preserving habitat for the tiny Key Deer and helping people in need by donating to Habitat for Humanity of Key West and the Lower Florida Keys! Anyone can �Own a Piece of the Rock� in Key West and the Florida Keys! 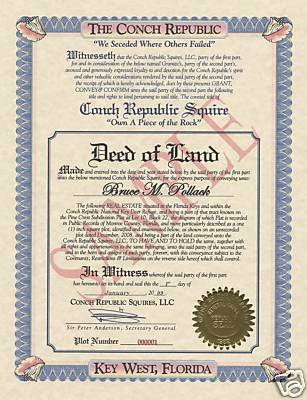 Become a land-owning Conch Republic Squire! A fine parchment Deed signed by the Secretary General of the Conch Republic and authenticated with an embossed gold-foil seal and personalized with the name you request, entitling that person to ownership of one-square-inch of Paradise and making them an official Conch Republic Squire. The reverse side of the document contains a brief history of the Conch Republic, the story of the dog-sized Key Deer and the first Conch Republic National Key Deer Refuge.